Wow. Maybe you’re getting paranoid. ;) I travel by bus every day, twice a day. I have never heard the message. Fortunately I’m rarely on train – otherwise I may have cracked up hearing him so often. Not terrifying, just annoying. Also I’d be surprisec if any of them would have the wit to launch some sinister attack on our freedom. Piss up in brewery springs to mind. I do love and your excellent blog, but is there any need to be such a raving drama queen over this?! What else scares you, birds flying overhead? Crossing the road?! Ha! I’m only poking fun, of course. I have to say that I actually like that fact that he is realising (albeit far too late) that their travel arrangements are monumentally shambolic and it needs drumming home to a lot of people that this is going to be difficult. At least he’s making the effort, even if it is far too little, far too late. I’ve heard him say ‘This is the big one!’ at London Bridge station. What, he’s voiding his colon or something? To “Scared of Chives” (great name by the way) – you owe me some screen wipes. I will remember not to drink coffee whilst reading your comments in future. Better not watch this then! To state that these messages ‘make you feel as though you are living in a police state’ shows no respect for people who are living in police states and suffering real restrictions on their freedoms, and belittles those who truly are fighting for their human rights. As you acknowledge, public address systems have been in use in London for some time – without our liberties being infringed (even now). I like to think it’s a form of psychologial punishment for all those delightful transport personnel holding the city to ransom over additional payments for actually doing their jobs over the Olympics. I’m afraid I can’t but I’d love to know the exact reason they are closing platforms 1-6 at LB station on Monday 30th from 1800-2200. I can probably have a good guess but I find the fact that the posters informing us of the closure don’t feel like they need to offer up an explanation. …very annoying. I find the fact very annoying. Henry- I don’t think Bugle is necessarily having a go at Boris. There isn’t a comparison, though Ken would never make it like that, would he? Anyone who read 1984 or Animal Farm can see Bugle’s point. By the way, we are almost living in a police state. 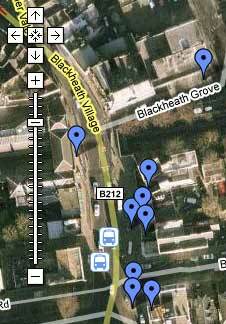 Every 4 person in Britain, has a CCTV camera of their own. I wonder what is the equivalent for tannoys? “Security personell tour this station 24 hours a day” – slightly more police state than “Hi folks”. At least it would be if it was true. That’s a really good point. For some reason that message bothers me less… Maybe because it doesn’t contain any personality? The bus messages came on this Wednesday didn’t they? 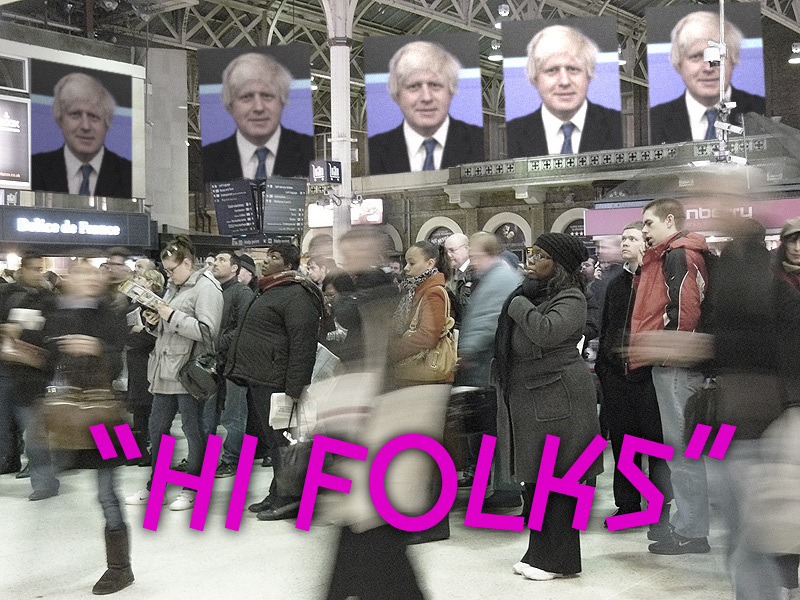 A bit later than the Boris messages that welcome you at Euston station etc. As you say, if it didn’t all come across as the Boris show it might be more palatable. It is, however, completely unnecessary to repeat the message every few minutes. That repetition was driving us nuts on the 88! So much so, there was quite a lot of ‘tutting’ and ‘oh for heaven’s sake’. Hi everyone. I love reading all your comments etc., I was brought up in Blackheath but now live in Adelaide, Australia bu love to keep in touch if possible.